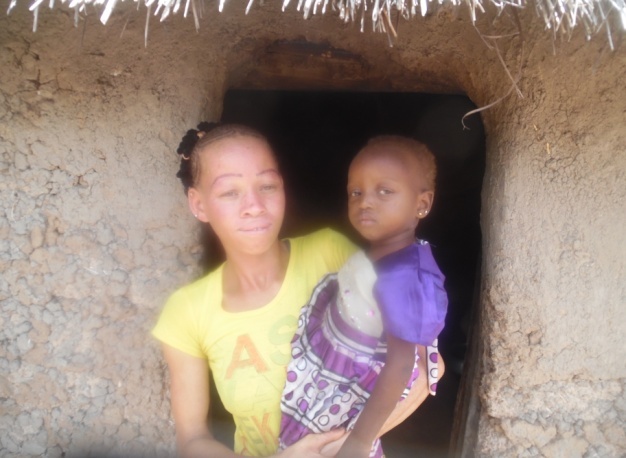 In this interview, Sekou Coulibaly, an IFAD project advisor from Mali spoke with Mariam Taore, 19, a young mother living in a remote rural community about 10 km from the capital of the municipality of Narena. Taore was born with albinism, a congenital disorder in which people lack colour pigmentation in their skin, hair, and eye. Her parents were the founders of her village. Q: Could you describe what you do to earn a living? How did you get into this type of work? A: Every day I go looking for vegetables and other fruit products available depending on the period and sought after on the market. I buy them and sell them along the road, located in one kilometer from the village to passers-by, motorists, motorcyclists, passengers or even the villagers and so on. Q: What are some of the challenges you face living in a rural community? Q: What key issues concern you most as a young person? "As albinos, we are often totally excluded and we have to even hide sometimes." Q: What are your plans/dreams for the future? "I want to specialize in poultry farming. I want to have a large farm with poultry, various chickens, guinea fowl etc. My dream is to become a major producer recognized in the area. I want to be known as someone whose handicap did not stop them from being open to the world and starting a business." Q: Some young people may have a negative view of farming, rural areas, and agriculture. What are your own views/thoughts? "Young people have ambition but not the means to achieve them. Many move to the cities or even try and migrate to Europe to work! My opinion is that living in a rural environment is like living in paradise. There is not a lot of noise and lot of natural clean air." A: Create conditions for expansion. Build cultural houses, organize activities, cultural events, training centers and provide communities with light and basic needs (mills, drinking water, health, and social structures). Q: What has been the greatest lessons you have learned so far? A: I have learned that working hard pays off. I have learned that patience is a golden path riddled with uncertainty but better than deadly landslides in the mines [laughs]." A: It is a widow in my community. She is very brave with a rather extraordinary story. She has had success through market garden production activities in the village. She's a fighter woman who inspires me." A: Do what you love to do. Fight hard. Give a lot of attention and expertise towards what you are doing. Put your heart in it."